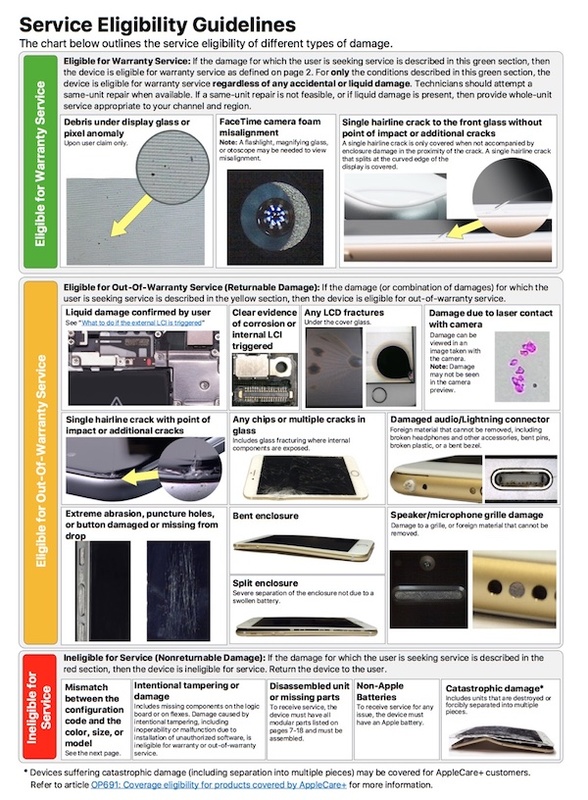 Apple’s iPhone repair and warranty rules shown off in detail in a leaked internal ‘Service Eligibility Guidelines’ document from the company. You can check it out right here. If you have ever taken your iPhone into an Apple Store to discuss repair or replacement, you may have noticed that it can often come as a mysterious experience with no real knowledge on what the outcome will be or what direction the Apple representative will take. Consumers often wonder if Apple actually has any real policies in place, but it’s now evident that the company actually does after an internal “Service Eligibility Guidelines” document leak gives additional insight into how the company’s repair service works. The document, originally shared by Business Insider, is a relatively recent piece of literature, dated March of this year, and is referred to internally by Apple staff as the “VMI,” which stands for “Visual/Mechanical Inspection.” It’s essentially the internal blueprint used by staff to determine if a customer with a broken or faulty device should be offered an in or out of warranty repair, or if that individual should be turned away altogether. To make it extremely easy to follow, the VMI is broken up into three individual “traffic light” sections, with green meaning that a customer is eligible for a repair under the device’s warranty, amber meaning that that specific customer is eligible for what is known as an out of warranty repair, and red meaning that they are entirely ineligible for service. In other words, if the damage described by the user falls under the inclusions in the red section, then the “device is ineligible for service.” Apple’s advice to the in-store operative in that instance is to “return the device to the user.” Not exactly the best news for the hardware owner, but as a business, Apple clearly cannot take the cost of repairing or replacing all devices of any age. If you are thinking of taking a damaged device back to Apple, and want some indication of how successful you will be, then finding that you have debris under the display glass, or a display pixel anomaly, would fall under the green section. As would a single hairline crack in the front glass of the device without a point of impact or additional cracks on the display. If you have intentionally tampered with the device or had a non-Apple battery fitted, then it’s almost a given that you would be turned away as ineligible for service under the guidance of the VMI.